I'm using live writer since it's beta releases. I currently write in two blogs. Technical blog, in English, and a cooking blog in Hebrew. 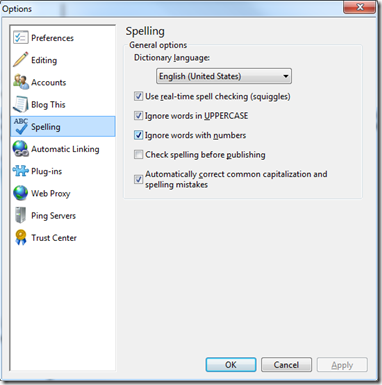 One of the biggest pains in Windows Live Writer was that the spell check dictionary was installed according to the installed language of Windows Live Essentials. 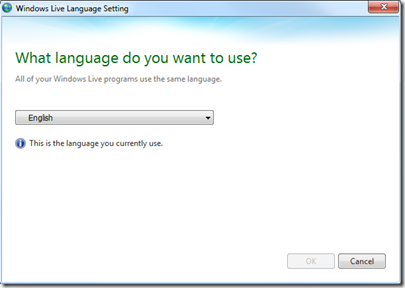 That means that if you downloaded the English version of Windows Live Writer, you had only the English dictionary. A problem for someone that writes in different languages. You can change the language to the one you want to install. An internet connection is needed to download the settings. This will add the dictionaries but also change the UI to the selected language. So if you want to change the UI back, after the installation is complete simply return the setting back to the desired language. Don't worry… the dictionaries will not be erased. Notice that unfortunately for now, you can not have two dictionaries working simultaneous, so you need to switch the dictionary manually when you need it.